It's becoming increasingly clear that the question we have to ask is not IF the Trump Administration will go down because of their treasonous relationship with Russia, but WHEN it will happen. And I'm happy to report that the news media is out for blood. You can tell Trump's getting nervous. Look at how many Tweets it took him to get to his new catch phrase, "Witch Hunt!" THE PRESIDENT: Thank you. Thank you very much. What an honor. They just gave me this beautiful jacket. They said, here, Mr. President, please take this home. I said, let me wear it. (Laughter.) And then they gave me the beautiful hat, and I said, you know, maybe I'll do that. We have a great "Make America Great Again" hat, but I said, this is a special day, we're wearing this. Right? (Applause.) I have no idea how it looks, but I think it looks good. It's a great-looking hat -- just like this is a great-looking ship. 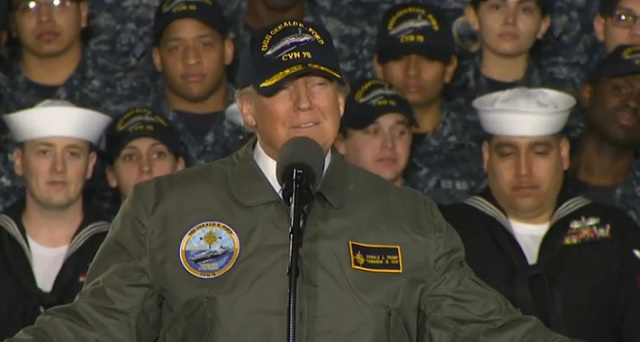 You know Donnie, if you hadn't lied about bone spurs back in the day, you might have been able to wear one of those beautiful hats on a great-looking ship for real. The soon-to-be commissioned Gerald R. Ford USS -- what a place. It really feels like a place. You stand on that deck, and you feel like you're standing on a very big piece of land. But this is better than land. It will not only be a great symbol of American strength, but a great legacy for your father, and our former President, Gerald Ford. President Ford was a Navy man. By the way, he was also a great athlete, for those of you that didn’t know. He saw action in the South Pacific during World War II. He served this country with honor -- in the military, in Congress, and in the White House. The proud dignity of this ship is a fitting tribute to Gerald Ford, the man and the President. You can tell that Trump learned a few things about President Ford 20 minutes before giving this speech. Really? Really? So what happened to this? When the Secretary walks in just name drop like it's hot. Drop it like it's hot. We will give our military the tools you need to prevent war and, if required, to fight war and only do one thing -- you know what that is? Win! Win! (Applause.) We're going to start winning again. Let me congratulate Captain Richard McCormack, Commanding Officer of the Gerald R. Ford. This ship will make an extraordinary addition to the fleet like no other -- like no other. Anywhere in the world there's nothing like this. It represents the future of naval aviation. I have no greater privilege than to serve as your Commander-in-Chief and the Commander-in-Chief of the men and women of the United States military. Great people. (Applause.) Great, great people. If people got paid for name-dropping, maybe Trump could have avoided a few of his SIX bankrupcies. This great aircraft carrier provides essential capabilities to keep us safe from terrorism and take the fight to the enemy for many years in the future. The great Admiral Nimitz, who commanded the U.S. Pacific fleet through the Second World War, once said, "It is the function of the Navy to carry the war to the enemy so that we'll not be fought on U.S. soil." True. (Applause.) And it was under Admiral Nimitz's command 75 years ago this June that the Navy did just that at the Battle of Midway. You've all known about the Battle of Midway, where the sailors of the U.S. Navy fought with the bravery that will be remembered throughout the ages. Storied bravery throughout the ages. The backbone of the American fleet at Midway was three beautiful aircraft carriers: the Yorktown, the Enterprise and the Hornet. All three were built with American hands right here at the Newport News Shipyard. (Applause.) At Midway, America was greatly outnumbered by, I mean, a lot -- (laughter) -- and its fleet badly damaged. But the heroic deeds changed the course of history. Many brave Americans died that day, and, through their sacrifice, they turned the tide of the Pacific War. It was a tough tide, it was a big tide, it was a vicious tide, and they turned it. Yes we did lose 307 brave sailers, airmen, and marines but not because we were "greatly outnumbered." In fact, we absolutely decimated the Japanese fleet and killed more than 3,000 members of the Japanese Navy in part because Admiral Nimitz was able to consolidate such a large fighting force that he overwhelmed the Japanese invasion. The US fleet comprised 26 ships, 16 submarines, and 360 aircraft. The Japanese fleet had just 21 ships and 264 aircraft because they had dispatched a large portion of their force north in a botched attempt to invade the Aleutians. That victory was the turning point in the Pacific War. That's really interesting because in 2009 (Bush's final budget), the Department of Defense received a $515.4 billion budget. And in 2017, Obama's final budget put Defense spending at $582.7 billion. I'm pretty good with numbers and to me that looks like a 13% increase. The sequester didn't actually cut the Defense budget. Rather it capped the growth of the Defense budget. Republicans passed the Sequester. You didn't think they'd really actually cut Pentagon spending did you? He just keeps running with those same lies. Our military requires sustained, stable funding to meet the growing needs placed on our defense. Right now, our aging frontline strike and strike-fighters -- the whole aircraft; many, many aircraft -- are often more likely to be downed for maintenance than they are to be up in the sky. Our Navy is now the smallest it’s been since, believe it or not, World War I. Don’t worry, it's going to soon be the largest it’s been. Don’t worry. (Applause.) Think of that. Think of that. Well, he just basically told himself off right there. Sure the Navy had over 6,000 ships back in the 1940s, but that's when we actually fought Naval battles. Today we don't need over 6,000 ships. We need 12 carriers. A single battleship in today's fleet could have wiped out the entire World War I fleet. And save for a lucky shot, it probably could do the same to our 6,000 World War II ships as well. Wait so American planes don't soar the skies now? American workers don't build our fleets now? Thank God that only lasted 14 minutes. I'm not sure my head could have handled any more of that. It took me longer than 14 minutes to read your post!